Use this assignment agreement to transfer one or more contracts between two parties where the agreement of the party to the original contract cannot easily be obtained or where the original agreement allows transfer without the consent. This form of assignment is most commonly used when a large number of contracts are transferred from one business to another, for example when a telephone service provider sells its Republic of India contracts or a white goods retailer sells its maintenance contracts. The basic law is that A cannot transfer to C the obligations he has under a contract with B, without B agreeing. So what happens is that all three enter into a “novation” agreement whereby the proposed transfer is made with B’s permission. Most businesses that need to set up multiple contracts make sure the terms of the contract allow them to assign the contract without permission of B. In those cases, an agreement like this one can be used. If your multiple agreements do not include this provision, you may still wish to use this agreement and take the small risk that some subscribers or users may walk away. If they do not, but instead carry on as before and make their next payment to the new owner, they are, in law, affirming the contract with the new owner, and all is well. So a novation should be used where practicable and assignment is the fallback where there is a large number of contracts or where novation is unnecessary because all the contracts permit assignment anyway. Whether or not the customers stay or go after the assignment is very important. The exact tone to use in a letter or message is important. So we include with this assignment agreement a letter template to send to customers informing them of the change. 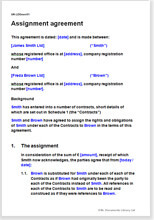 You should use a novation agreement rather than an assignment if all three parties are available and agree. Use: Novation agreement: transfer of service contract.